To celebrate thirty years of the RC30, Honda is bringing a cool pop-up RC30 museum to the 2018 Isle of Man Classic TT featuring famous bikes and riders. 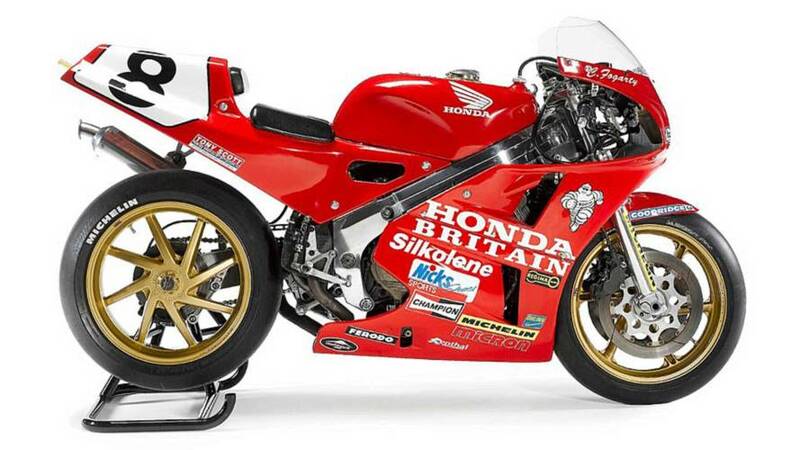 If you are a Honda RC30 fan, 2018 is the year to update that passport and get to the Isle of Man for the Classic TT race. In 1987, Honda introduced a full race variant of the VFR750 called the RC30. This capstone machine in Honda’s secret civil war between inline four and V-four factions made an iconic race bike. No major tech breakthroughs were found on the RC30, and horsepower was not best in this class, but it was tractable, solid in the corners, and a remarkably successful race bike. In official production until 1990, the list of race wins runs many pages. This anachronistic race bike is a perfect match for the archaic Isle of Man race course, sometimes known as the “most dangerous race track in the world.” I prefer the other popular title, “the only real race left in the world.” The RC30 was very well suited to the twisty, narrow lanes of the public road that rings the isle and forms a 37.4 mile race course lined with brick walls, trees, houses, and pubs. I cannot think of a better place to race. I’m not alone either, the mountain course has been in use since 1911. The RC30 played a major role in revitalizing the TT races after the Grand Prix organization pulled out in 1976 over safety fears. Far from giving up, sponsors switched to Formula One racing and managed to hang on long enough for motorcycle brake and frame evolution to match this difficult course. In the hands of Joey Dunlop, the RC30 showed the world how to go seriously fast on these roads. To celebrate 30 years of the RC30, Honda is bringing a pop-up museum to this year's Classic TT dedicated to the beast including many more of the rare bikes, riders, and history. The names of riders winning races and setting records on the Honda reads like a who’s who of racing—Steve Hislop, Phillip Mccallen, Carl Fogarty, Freddie Spencer, et al. Grandstand tickets are only 5 pounds, making this dirt cheap entertainment after airfare, bike shipping, and hotels. You should absolutely consider taking your bike and do a lap before the barricades go up. Live a little on those 37.4 miles of racing history. The Classic TT Race is run alongside the modern Supersport TT and Superbike TT races every August on the Isle of Man. Motorcycle Mecca to me. The classic race is open to bikes built before 1972, and post-classic bikes up to 1992. These categories are a bit quirky and require lengthy explanation, but general agreement is that massive technical changes came after those years. Capping eligibility at the peak time, just before a revolution came, results in close—really close—competitive racing. Watch a few minutes from previous years and let me know if I’m right. Keep in mind qualified amateurs can race as well, which is just the thing if you are a bit low on adrenaline.